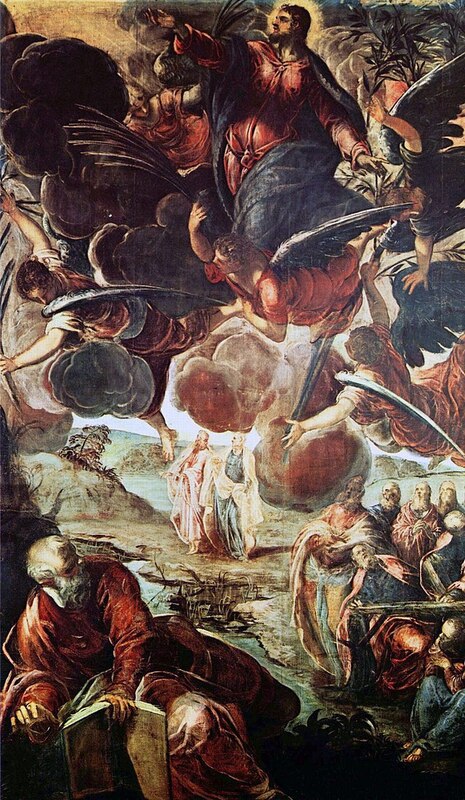 Today the church celebrates the ascension of our Lord Jesus Christ into his glory in heaven, to sit at the right hand of God the Father and rule as King over the entire universe. Why is that Christmas and Easter are such big deals in our culture, but Ascension and Pentecost are largely ignored? Have you ever thought about that? I think that the reason for this is that Christmas and Easter do not confront people with the lordship of Christ the way that his ascension does. Christmas is the easiest to accept for our culture. It’s just a sweet little baby born on a manger. Nothing there to confront me. Nothing there to make me take stock in my life. Even if we come to terms with the fact that this baby in the manger is actually God incarnate, it is still easy to sentimentalize and ignore. Baby Jesus. Sweet little Jesus. Tame Jesus. Easter is a little harder to deal with, but we can manage it OK. Easter confronts us with the unmistakable fact that Jesus is who he said he is, the Son of the living God. Easter means we have to believe in Jesus, we have to believe that he is real and that he rose from the dead. This is why Easter has been made into cute bunnies, eggs, and pastel colors. These are not wrong, but they make Easter more palatable. Still, for those of us who embrace the real Easter, all it does it make us come to terms with the reality of Jesus. We must believe in him. Yet when we come to the Ascension we are asked to do much more. We are asked not only to believe, but to take stock of our lives and to do what is right. The Ascension of Jesus means that Jesus is Lord. You are not lord. Your feelings are not lord. The government, the wealthy, the powerful, they are not lord. Jesus is Lord. This is the first of the Christian feasts that requires us to take stock of our lives and respond to the ever present reality of the lordship of Christ in our lives and over our world. So what does the Ascension mean for us? Why does it matter? I want to look at five reasons why the ascension of Jesus Christ really matters to all of us in our daily lives. 1 O LORD, our Lord, how majestic is your name in all the earth! You have set your glory above the heavens. 2 Out of the mouth of babies and infants, you have established strength because of your foes, to still the enemy and the avenger. 3 When I look at your heavens, the work of your fingers, the moon and the stars, which you have set in place, 4 what is man that you are mindful of him, and the son of man that you care for him? We have great dignity because of our created humanity. We bear the image of God and have been given dominion over the entire earth. Each and every one of you has great worth because God has made it that way. And the ascension of Christ means that this dignity and worth is fulfilled, cemented, and magnified. Jesus Christ is fully human and fully God. That means that a human being, a man, is now sitting in heaven and ruling the entire cosmos. Our humanity is raised and ascended with him! This magnifies the dignity and worth of all human beings. Our flesh is not something to be detested! Your bodies are not something to hate or abhor! Other races and nations of human beings are not in any way lesser than you or worthy of your subjugation! We all share a common humanity and that humanity has been raised up in Jesus Christ. Your bodies are beautiful. They are of great worth, because Jesus Christ has ascended. A human being with a real human body is the King of all. That means that all our flesh has been raised to this dignity. We are not to hate ourselves or hate other people. You have been raised up with Christ! So we see that we have access through Jesus to God the Father. We are told that we have bold access, that we are to go boldly to the throne of grace. But would that have been so if Christ had not ascended to heaven? NO! The reason we have access to God is because Christ Jesus ascended to heaven and he now sits at the right hand of the Father acting as an advocate for us. It is through Christ that we have access to the father. It is through the ascended Christ that we have bold access to him! How is it that we draw near to God? How is it that we draw near with confidence to the throne of grace? It is through our worship! It is by being consecrated by the living and active double edged sword of the word of God and by being raised up by the Spirit of Christ into the presence of the almighty. But we would not be able to do it without Christ, without the ascended Christ. It is he who gives us access to the Father. It is because of the ascension of Jesus Christ that we can, each week, ascend into God’s presence to worship Him, petition Him, and feast on and be nourished by the body and blood of his Son Jesus Christ. If Christ had not ascended into heaven, we would have nothing. You are raised up with Christ and seated in the heavenly places. You do this every week when we all gather together to worship God. Heaven is not merely a future hope, but a present possession for you, the Church, through Christ the ascended Lord. The ascension of Jesus therefore means that the work of the kingdom has been left for the church to accomplish. Have you ever thought about the fact that Jesus actually amassed very few devoted followers during his earthly ministry? In fact, as we from the ending of the gospel of Mark, Mark leaves no one left to boldly share the good news! Yet the ascension of Jesus means that Jesus himself is not going to take up that task. If Jesus had not ascended, if he had remained on earth as a king or religious leader, things would be drastically different. Have you ever wondered why he didn’t just stay? Why didn’t he stay? He tells us exactly why he didn’t stay. He went up because by doing so he enabled the church to become what it is today, a billion Holy Spirit filled Elishas who will be able to do far more than one earthly Jesus. Is that blasphemous to say? No, Jesus says, “You will do greater works than I.” The church is able to do more being empowered and filled with the Holy Spirit than one earthly Jesus could do. He left so that the church could also ascend. And our ascension means that we have work to do. We have his commission to fulfill. We, the church, are the hand of God in this world. Paul says in Ephesians 4:8 (quoting Psalm 68): “Therefore it says, “When he ascended on high he led a host of captives, and he gave gifts to men.” The gift that the Lord Jesus gives to men as he ascends on high is his church. The apostles and prophets and evangelists and pastors and teachers are all gifts to the church, which in turn is a gift to all men. So let us go out and be a gift. Let’s live in a way as the church like we truly confess an ascended Lord and let’s be about his business in this world! Thus, according to Paul, the atonement, the accomplishment of the forgiveness of your sins to make you right with God, was not completed on the cross, but that the resurrection of Christ was a necessary element of the atonement. Now, for certain, the sacrifice for sins was completed on the cross. The penalty that Jesus paid to God the Father was completed on the cross. Yet the complete atonement which makes you right with God was not complete. Jesus had to be raised. Paul says so. If Jesus had not been raised, you would still be dead in your sins. We confess this because it says that if we confess our sins, the Lord forgives us. We claim that precious promise each week for the forgiveness of our sins. Yet do you know what the next verse is? The REASON why you can have forgiveness of sins, the reason why you can be right with God is because Jesus Christ has ascended into heaven, sits at the right hand of the father, and can constantly act as an advocate on our behalf. He has paid the penalty for our sins, he has been vindicated by God by being raised from the dead, and now he sits at his right hand constantly advocating on our behalf. There is no atonement, there is no forgiveness of sins without the ascension of Jesus Christ! Jesus Christ is King of the entire universe. He is Lord of all. The US Government is not Lord. Jesus is Lord. The most powerful corporations are not Lord. Jesus is Lord. YOU are not Lord. Your feelings are not Lord. Your doubts and fears are not Lord. Jesus is Lord. This is why we can rejoice in our own weaknesses. This is why we can cast our cares on him. This is why we can boast in the Lord. This is why we are not to worry. This is why you can place your complete trust, in all areas of your life, in Jesus Christ, because HE IS LORD OF EVERYTHING. Jesus Christ is the victorious King, and he is Lord of all. He is Lord over your circumstances. He is Lord over your hurts. He is lord over your pain. He is lord over your uncertainties. He is lord over your fears. He is lord over your doubts. He is lord over your depression. He is lord over your families. He is lord over our city. He is Lord not just of the Church, but of every human institution. JESUS IS LORD! He has defeated death. Death hath no more dominion over you. He has defeated hell. Hell no more be a worry for you. He has defeated the grave. The grave will not hold you. He has defeated the devil. The devil can do nothing to harm you. Jesus Christ has ascended into the highest heaven in the fullness of his humanity and his deity. He is a human man and he rules and reigns over all things. Believe in him. Put your trust in him. And let him be Lord over your entire life and being. Hold nothing from him. Hide nothing from him. Keep nothing from him. He is Lord.